Sooooo Ya’ll, NC curves have been showing out lately! And by that I mean, they are launching amazing plus size online boutiques, being featured as the face of FFF Week 2017, and creating a plus size non-profit organization to support the growth and wellness of the community. Who is doing all of this you ask? Well, one particular curvie on the move and her name is Mallory B. Richardson and she is also the creator of the Crusade of Curves event and switching the plus size game all the way up! The Crusade of Curves is a three day plus size event located in several venues in downtown Raleigh, NC where a series of activities take place such as vendor shopping, model calls, fitness expos, and businesses panels. There is truly something for everyone to enjoy and be apart of! This year was the first of many, we’re sure of it! The ladies of by KikiSol attended the Saturday festives which included a plus panel luncheon discussing all things plus size business, the shopping event and the Evolution of Fashion show. 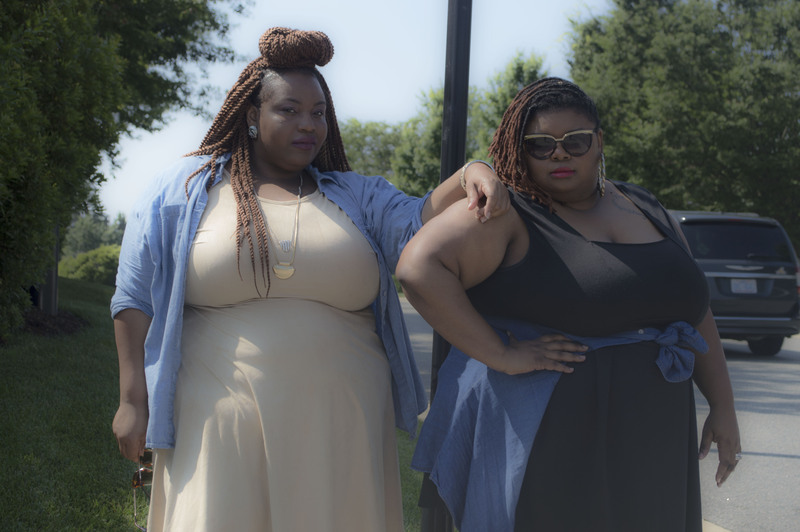 Yes hunni, we came to play and slay in these crusade of curves streets with the best of em! First up: The Plus Panel! We were honored to be asked to be apart of this unique and informative event and to share the stage with some heavy hitters in the plus size community like Kenyatta Johnson, the mastermind and driving force behind Greensboro based, I Rock my Curves the Best and The Power Plus Weekend: read about Sol’s #PPW experience here. As well as plus model beauty and complete sweetheart, Nikki Carter , Ms. Full Figured NC Pageant director, Purusha Jones, and photographer Jay Humble Lack. We chatted about the real deal on what it takes to succeed such as sleepless nights, how to monetize your brand , building and losing all types of “ships” in the process. Seriously, the experience was epic. I feel that I learned a lot from the panel and I was on it! Yep, it was that good! Make sure you are in a position to catch the next one! After the panel luncheon, it was time to shop! Now, you know your girl is always down to get some cute little swag and supporting other small business owners at the same damn time. There were so many options to shop. From clothing to accessories to eyewear and even credit repair, your coins were going to be spent at someone’s table. Clearly, variety was a focused area for the Crusades crew and we can dig it. I took a stroll though the tables and came across some great items from vendors such as Blue Hibiscus, Curvaceous Divas Boutique , Just Carra, just to name a few. Here are a few pictures of what I came home with. Total success if I say so myself! After the shopping, we decided to grab some lunch with the other panelist, Kenyatta and Nikki, and enjoyed a little girl time while the venue was transitioning to the evening set. The final event for the 1st annual Crusade of Curves was the Evolution of Fashion show. Now, if you don’t know anything about Ki & Sol, then you must know one thing, we HATE fashion shows! Nothing personal but we feel like we have seen the same ole thing before and a lot of folks have “fashion shows with no fashion” ..no shade, no tea.. BUTTTTTTTTT this was not the case for Crusade of Curves. They had fashion and lots of it! A fashion show that consisted of quite a few local designers such as Goldelanllc, Designs by DeAngelo, Unorthodox Appeal, Jazzy Defined Intervention and national brand, Torrid. We were throughly intrigued to see the local fashion options we have for the plus size market and even accessories. As ya’ll know, the resident Carolina Curves models brought the fierce and sass down the runway. Take a look! The Crusades of Curves was a breath of fresh air, to say the least. It covered so much ground beyond plus size modeling and offered to be an informative event as well as entertaining. The shopping was on point, the venue was a doll and the company was beyond exceptional. I am very excited to see how this Raleigh gem will grow through out the years. Make sure you are in attendance next year and stay up to date with their happenings by following the Crusade of Curves IG page. Now, more pictures from the event! What plus size events do you plan to or have attended in 2017? Health Yeah! | Update + 3 Ways To Start Taking Care Of Your Health TODAY!